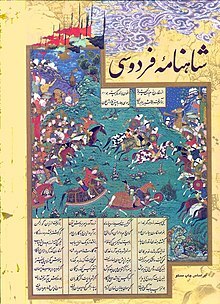 The Shâhnâmeh (Persian: شاهنامه Šāhnāmah - "The Book of Kings" or "The Epic of Kings"; alternative spellings are Shahnama, Shahnameh, Shahname, Shah-Nama, etc.) is an enormous poetic opus written by the Persian poet Ferdowsi around 1000 AD and is the national epic of the Persian speaking world. The Shāhnāmeh tells the mythical and historical past of Iran from the creation of the world up until the Islamic conquest of Iran in the 7th century.— Excerpted from Shahnameh on Wikipedia, the free encyclopedia.